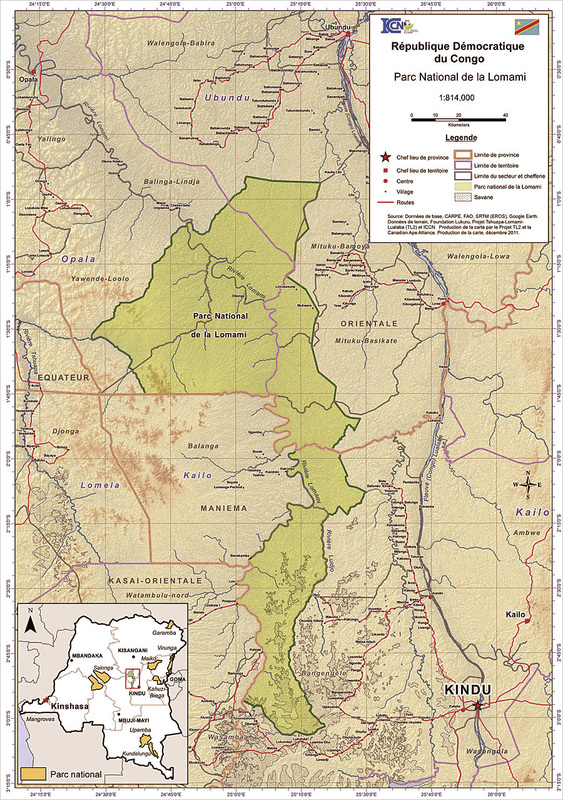 Lomami National Park occupies previously unexplored wilderness in central Africa's Congo Basin. After almost a decade of work to secure the land, the Democratic Republic of the Congo (DRC) received its first national park in more than 45 years when then-prime minister Augustin Matata Ponyo officially established Parc National de la Lomami in July 2016. The 3,500-square-mile (9,000-square-kilometer) swath of land, known in English as Lomami National Park, is the first national park created in the DRC since 1970 and only the eighth area in the country with this designation, which garners the highest level of protection. GIS has been the backbone of the project since its inception in 2007, when the Lukuru Foundation began exploring the scarcely observed landscape between the Tshuapa, Lomami, and Lualaba Rivers. Beyond what local hunters understood, little was known about the forest composition or animals within this 15,000-square-mile (40,000-square-kilometer) area. The initial expedition, called the TL2 project (named for the three rivers), was led by John and Terese Hart, whose experience in diplomacy and field research prompted them to make it a locally based undertaking. With funding from the Arcus Foundation, the Abraham Foundation, and the US Fish and Wildlife Service—along with an Esri conservation grant procured through a partnership with the Canadian Ape Alliance—the Harts composed a dedicated team of Congolese field biologists who used GIS to collect field data. As the project evolved, TL2 also used GIS to work with people from the area to delineate logical park boundaries, monitor wildlife, and establish protections for the park. Thus, Lomami became the first national park in the Congo (and one of few in Africa) to be established with major backing from local communities. Lomami, which is almost as large as Yellowstone National Park in the United States, is one of the last true wildernesses on earth. It lies in an area of the Congo Basin that has some of the highest levels of biodiversity in the world. But protecting it wasn't easy. 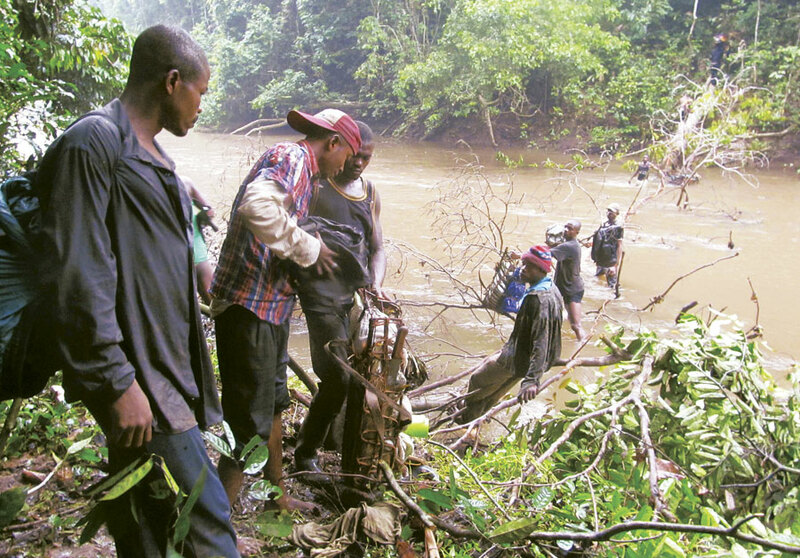 Congolese field biologists used GIS to collect field data all over this unexplored wilderness—sometimes having to form human supply chains to get all their materials across rivers. "The model we pursued from day one was to work from the bottom up, gathering village support immediately through conservation education," said Nick January, a volunteer GIS applications specialist with the Canadian Ape Alliance, a nongovernmental organization based in Toronto, Canada. "This approach builds the strongest foundation possible." From the first surveys conducted in 2007, the TL2 project recognized the benefits of employing GIS to explore, document, and define the region for conservation. That year, TL2 developed an innovative partnership with January and the Canadian Ape Alliance, which had been receiving an Esri conservation grant since 2005 for gorilla research in the DRC. 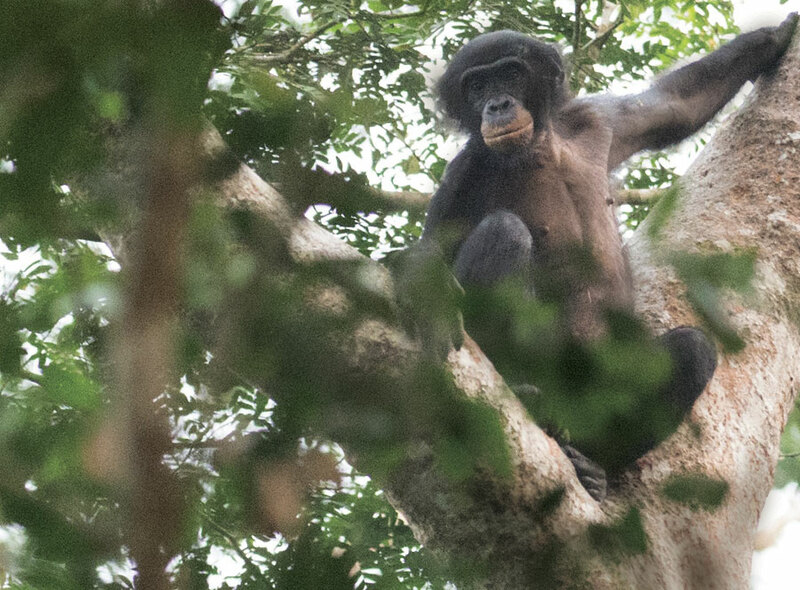 With the Canadian Ape Alliance leading the implementation of GIS at Lukuru, the Harts and their researchers gained access to a full range of advanced Esri software licenses and extensions. Because it was so difficult to obtain complete and accurate geospatial data for the area, TL2's first mission was to construct a reliable basemap using ArcGIS. At the start, the organization only had one basic digital map to work from. 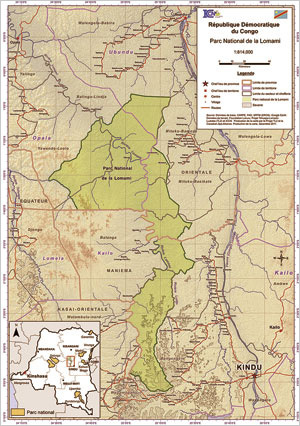 To get information on boundaries, transportation, population centers, and the like, the project relied on generalized open data from sources such as the United Nations' Food and Agriculture Organization (FAO), the Shuttle Radar Topography Mission (SRTM), and the United States Agency for International Development's (USAID) Central Africa Regional Program for the Environment (CARPE). From 2007 to 2008, researchers also conducted field expeditions to survey the area. They observed wildlife and used GPS to map animal tracks, which helped them highlight areas that needed to be revisited and surveyed in greater detail in subsequent years. Right away, the team discerned zones with important animal populations and other areas devoid of wildlife. Simeon Dino, the program coordinator for Tshopo Province, leads a research team across a savanna in Lomami National Park. With good digital data of the area finally coming in, the TL2 team was able to begin a process of constantly refining the existing spatial data and continuously organizing the steady inflow of new field data, which included reconnaissance surveys; maps of trail systems, wildlife observations, and small communities; and documented evidence of hunting. Soon, the organization developed a comprehensive, current, and dynamic mapping system that pulled information from multiple sources in the field and revealed areas with strong wildlife populations and limited human interaction—prime locations to protect. As the national park started to take form, the digital maps generated by TL2's GIS evolved on-screen into a dynamic representation of the proposed park that contained diverse habitats ranging from tropical lowlands and forested hills to swamps and natural savannas. Throughout the project, TL2 field researchers made a number of important discoveries. In particular, GIS helped them document and map the existence and range of many wildlife species. It is now known, for example, that Lomami is home to several rare or endemic primate species, including the recently discovered lesula monkey and a newly identified population of the extremely rare Dryas monkey. Other important primates found within the park include populations of the bonobo chimpanzee, wolf's monkey, the blue monkey, and the red-tailed monkey. Researchers confirmed the existence of the okapi, the DRC's endemic forest giraffe (whose presence was only suspected before). TL2 documented more than 275 bird species as well, including the vulnerable Congo peafowl. And at least 500 African forest elephants were found living in the park—one of the country's last remaining elephant populations. While all these discoveries were being made, the Lukuru Foundation broadened its activities beyond just research and monitoring to include the whole scope of protecting and maintaining the park too. It is now known that Lomami is home to several important primates, including populations of the bonobo chimpanzee. During the time that the park was temporarily designated as two provincial parks, Lukuru research teams patrolled certain areas to look out for poaching activity. The organization then helped with guard training for Lomami National Park, first in association with the military and then, starting in 2015, with the Congolese Institute for Nature Conservation (known by its French acronym ICCN). The park guards, who were selected almost exclusively from the surrounding communities, are now dispersed in the seven operational surveillance camps that Lukuru established on the park border and within its boundaries. Maintaining commitments like this with local populations is imperative to the success of Lomami and helps convey the park's immediate value. Having members of local communities work as administrators, researchers, assistants, and porters through Lukuru has certainly added to the enthusiasm and determination of staff on the ground to keep this project going. Without community members' continuous outreach, close connections, and ability to foresee problems and provide local solutions, the plans for this national park would still be far from realization. 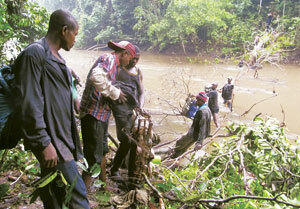 As Lomami National Park continues to develop, so does its GIS. Project partners in both the DRC and Canada are using multiple licenses of ArcGIS Desktop to continue incorporating new field data into the system, refining boundaries and settlement locations, identifying areas of interest, and mapping animal tracks and evidence of hunting activities. Additionally, researchers on the ground are now employing more advanced pieces of software such as ArcGIS Spatial Analyst to do density mapping of wildlife observations. January has developed several story maps as well, including one called Wildlife Camera Trap Locations that shows Lomami wildlife videos captured by park cameras. And now that field staff are managing most of the on-the-ground GIS for Lomami, TL2 is currently exploring how it can use ArcGIS Online as an innovative education platform through which to reach audiences around the world. For more information on the TL2 project and Lomami National Park, visit the Lukuru Foundation's website; read field notes from the project's director, Terese Hart, PhD; email Hart; or contact the Canadian Ape Alliance's Nick January, GISP.